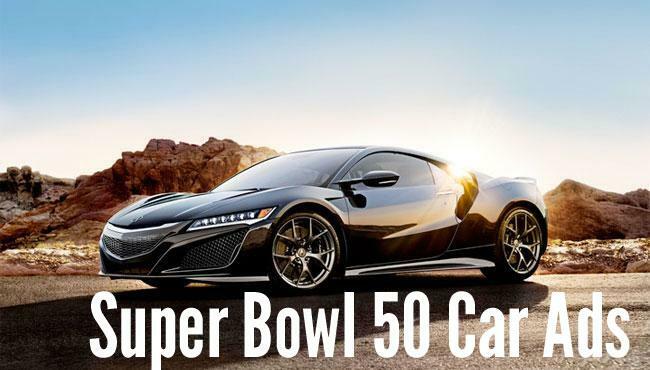 The Super Bowl 50 Ads will contain a significant list of car commercials. So far seven car brands have confirmed a Super Bowl 50 ad, with several of regular car makers not having revealed their Super Bowl 50 plans. Most notably Chrysler (FCA) has not revealed anything yet about their Super Bowl 50 commercial plans, if there are any. So far our Super Bowl 50 Ad Chart lists Acura, Honda, Hyundai, Mini, Kia, Buick and Toyota as Super Bowl 50 advertisers. The Honda Super Bowl 50 Ad will promote the 2017 Honda Ridgeline truck. The new Ridgeline debuted this week at tha NAIAS 2016. Hyundai is taking the anniversary Super Bowl very seriously and will run four commercials directed by famous directors including Peter Berg. Four Super Bowl 50 ads.